The latest report from network monitoring firm RootMetrics shows that both Sprint and T-Mobile made improvements in overall performance during the second half of 2014. Verizon was ranked as the top carrier in the United States for the third consecutive study, trailed by AT&T, Sprint and T-Mobile, based on several categories: speed, reliability, call performance, text performance and data performance. The new data reveals Sprint closed out the second half of 2014 on a high note with significant improvements in network speed, reliability and call performance. While it continues to trail market leaders Verizon and AT&T, Sprint's network enhancements were enough for it to surpass T-Mobile in the United States and on a state-by-state level during the final six months of the year. While the network still trails the leaders in every category, Sprint made tremendous strides—particularly in reliability—in the second half of the year. In fact, Sprint improved its tally of reliability index wins by 25 (all shared) compared to what we saw in the first half. Also consider that in the first half of 2014, Sprint recorded a download success rate below 97% in 108 out of the 125 markets that we tested; in this round of testing, that market count had dropped down to 52. Despite ranking last in the United States and on a state-by-state level, T-Mobile continued to make improvements in large metro areas, with fewer dropped calls, blocked calls and failed downloads. RootMetrics predicts T-Mobile could place even more pressure on leading carriers Verizon and AT&T if it continues to make improvements in these regions, such as New York City, Chicago, Washington D.C., Philadelphia, Houston, Seattle and Las Vegas. Overall, Verizon and AT&T continue to offer the best network coverage and reliability nationwide, but T-Mobile and Sprint are stepping up the competition with continued improvements. The full RootMetrics report provides a comprehensive look at all four major carriers in the United States. Go go T-Mobile you can do it! They are getting closer and closer. Looks like Sprint improved in call reliability a lot but data speeds remain their achilles' heel. T-Mobile has the great data speeds but of course needs to finish addressing their rural data coverage issues. WHAT!? Sprint is actually beating T-Mobile in Overall Performance & Reliability??? I thought Sprint would be dead last in every category. I'm actually shocked about this. T-Mobile ranks worse than Sprint (at least in this benchmark)? That's saying something. Legere is a charismatic guy who has some good ideas, no question about that. But his company still has a ton of work to get done and the other carriers aren't sitting still. Just for giggles, I went to the T-Mobile site just to take another look at their LTE coverage in my region to see if it's gotten any better. Nope. I live in Metro Atlanta; and as long as I stay within 50 miles of home, I'd pretty much always have LTE coverage with T-Mo. However, we usually drive to Florida a couple of times a year. Guess what? Once you leave the southern suburbs of Atlanta heading south on I-75, you lose LTE until you get to Macon (a distance of 50 miles). Then you lose it again once you leave Macon until you get to Valdosta (a distance of 120 miles). Put simply, T-Mobile's LTE coverage map in my region looks like a Verizon or AT&T coverage map from 1995 (i.e. you're covered near bigger cities but beyond that, forget it). According to T-Mobile's own map, more than half the state of Georgia outside of Metro Atlanta has 2G coverage on T-Mobile. Yeah. T-Mobile might have attractive pricing; but I'd rather pay a price premium with Verizon and have LTE 99% of the time regardless of where I go as opposed to saving $20 or $30 bucks a month for "unlimited" data on T-Mobile only to have my phone drop to 2G when I have to drive outside of a metro area. Unlimited 2G data is not even worth $20 a month, in my opinion. Huh. When I checked last year I had found charts showing AT&T edging out Verizon. Not sure what charts you were looking at. 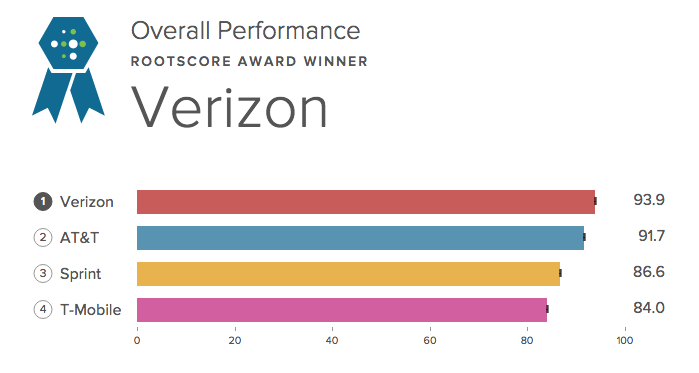 Verizon has always been in 1st place overall since they started doing the nationwide comparisons. Due to their rural coverage they win almost every state.